LAST SATURDAY NIGHT at one in the morning I walked into a performance called “foreignfire presents: Thresh” at the 14th Street Y. I was in the beginning stages of regret at having stayed so late to participate in an immersive piece of performance art by a new acquaintance, the Israeli sound artist David Katz, who founded the collective foreignfire. I’d met Katz the night before, and had been genuinely compelled by the way he described the relationship between his art-making and the traditional liturgy he engages with in his role as music director for a Reconstructionist synagogue in San Francisco. But by that point in the night I was tired, and felt burdened, too, by the weight of the Jewish content I’d learned, chanted, heard, and consumed under fluorescent light in the Y’s “dusk to dawn” Shavuot program. But I’m glad I stayed, because “Thresh” turned out to be the best part of the night, and my only meaningful (and unexpected) engagement with the Book of Ruth, Shavuot’s primary text. I fear I’ll spoil the experience for future participants by describing it here, but I also can’t stop thinking about the way Katz facilitated an experience in which meaning was layered in concrete and conceptual terms through the spontaneous orchestration of bodies in space. The first sheet I opened said simply, don’t go home hungry, which delighted and disarmed me. I re-formed the paper into a ball, tossed it back into the pile, and chose another one, which said something like sit at the feet of someone who is standing and follow their lead. So I found someone who was standing and brushed the piles of paper away to sit at his feet; about a minute later he kneeled down beside me and looked into my eyes and held that eye contact silently for half a minute or so before reaching over and kissing my forehead. The moment was charged with intimacy and ambiguity. And so it went: there were directives that involved vocalizations, including one that asked me to take someone’s hand and walk counter-clockwise around a standing person 10 times, whistling or singing a blackbird’s song. This I happened to do with Katz, whose bird-call whistles were so accurate and lively that most of the room seemed to turn almost imperceptibly to listen. 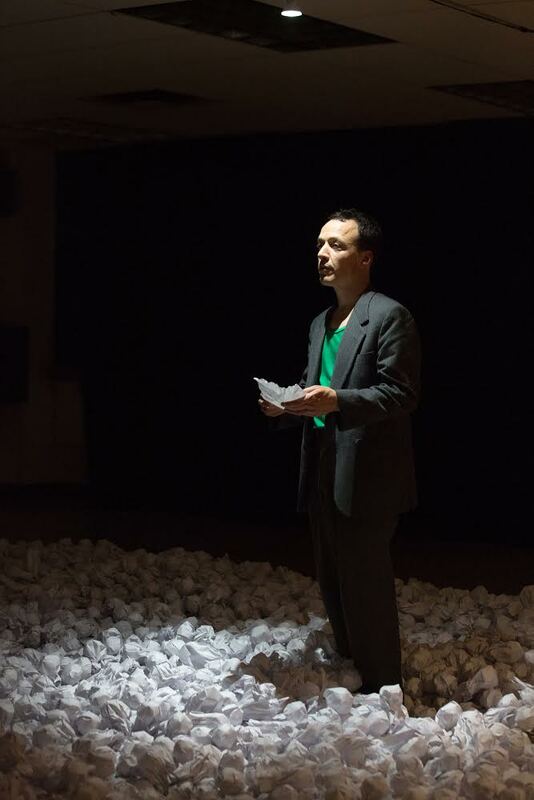 Throughout the performance, participants were consistently engaged in the directives, or waiting, or watching, all of which Katz calls “threshing” in the texts (as in the directive keep threshing). Other notes asked me to walk, howling, from the center of the threshing floor to the outer edges, or to sing someone a song from my childhood, or to scream as loudly as I could. Sometimes the texts just said things like keep looking until you find it, or don’t leave. Each time I discovered a new directive, even these simple but existential ones, it was a quiet thrill. I felt increasingly under the spell of an intense game you can lose yourself in precisely because you know that—even if it’s scary—ultimately you’re safe (it turns out it’s a little terrifying to make strange and sudden loud noises in a quiet room full of strangers). One directive said come closer, another come closer until you eat it, which I decided meant to kind of face-plant in the paper thresh, to lie there for a while just listening to all the motion around me. I could hear a steady shuffle of the paper being walked through, a crumpling crunchy orchestration that I imagine is meant to recall the sound of actual threshing: the act of separating grain from chaff, in the ancient world achieved by a beast of burden crushing sheaves with its hooves, led in a circle. This practice took place on what’s called a threshing floor, which I know from the story of Ruth as the site of her offering herself to Boaz, if somewhat ambiguously, and if “offering” is the right word in terms of her agency in a story that lays bare the difficulties and tragedies of being a single woman and a stranger in a foreign land. And so I found myself lying on the floor and thinking about threshing, which is an act of force that also requires delicateness, like art-making, like prayer, like love. As people came in and out of the room it became obvious who was timid and who bold, which pushed me to be braver in the contained space that functioned like a kind of sideways mirror. It ended as subtly as it had begun, with only a few people left in the room after two am. I left for a few moments to collect my thoughts. When I returned to say thank you to Katz, I saw him standing in the room looking out over the masses of paper. The air was still quiet, still charged, though the pressure of the performance was broken. Maia Ipp is an editor at Jewish Currents and co-founder of Festivalt, an avant-garde Jewish arts festival in Krakow, Poland.